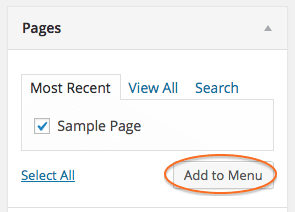 By default, WordPress will list your Pages in alphabetical order as your menu. If you would like to customize this menu, you can create a custom menu. 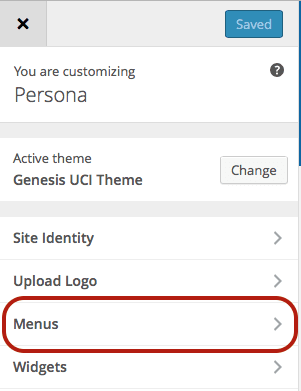 Note: Not all themes on UCI Sites support custom menus. Some of our older themes can only use custom menus in a sidebar widget. Go to the Navigation Toolbar and select Appearance > Menus. At the top of the Edit Menu page, click on the link, create a new menu link. Type in a name for this custom menu in the box. Click Create Menu. You can automatically add new top-level pages by clicking the box, “Automatically add new top-level pages to this menu”. Make sure to click Save Menu again if you choose this option. You will be adding menu items from the expandable panel on the left. 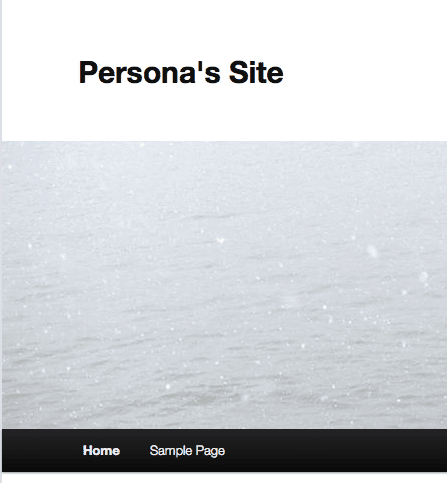 You can make almost anything appear in your menus including pages, links, posts, categories, and tags. You will need to create and publish any pages you want to add. From the expandable accordion panel on the left, click the Pages header to expand the options. Check the pages you want on your custom menu and click Add to Menu. When satisfied with your changes, always remember to click Save Menu on the screen. From the expandable accordion panel on the left, click the Links header to expand the options. Type in the URL or web address to the site. Type the Link text (the Menu label). From the expandable accordion panel on the left, click the Categories header to expand the options. Check the categories you want on your custom menu and click Add to Menu. Any posts with that category will be displayed in an archive view. From the expandable accordion panel on the left, click the Tags header to expand the options. Check the tags you want on your custom menu and click Add to Menu. Any posts with that tag will be displayed in an archive view. 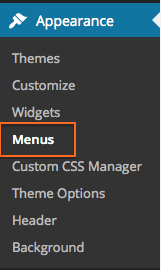 Important: Each time you add menu items or make any changes to your custom menus you must click Save Menu, otherwise the menu on your site will not update with the changes. Now that you have added some items to your custom menu, you need to select the location that you want to display it. Some themes have multiple locations. Some older themes do not support theme locations*. In the Menu Settings area, check the box next to the location where you want the menu displayed. View your site to see your new custom menu. Return to add and modify your menu as needed. *If the current theme does not support menus, the following message will display: "The current theme does not natively support menus, but you can use the “Custom Menu” widget to add any menus you create here to the theme’s sidebar." You can still make a custom menu through the Custom Menu widget and the menu will be located along the sidebar. Custom Menus can also be used in combination with the Custom Menus widget. You can create different menus and change which menu is displayed by using Theme Locations. Also, if the theme you’ve chosen supports multiple menus, Theme Locations will display a Primary and Secondary navigation drop-down. 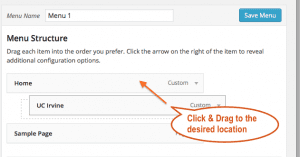 As you add Custom Links, Pages and Categories to your Custom Menu, you may want to rearrange the order of the items. Go to the Admin Panel and select Appearance > Menus. In the Menu Structure section, drag and drop menu items into the order you would like them to appear on your site. Tip: If you are using sub-menus, you may want to make the top-level menu item simply a placeholder for the menu items below. 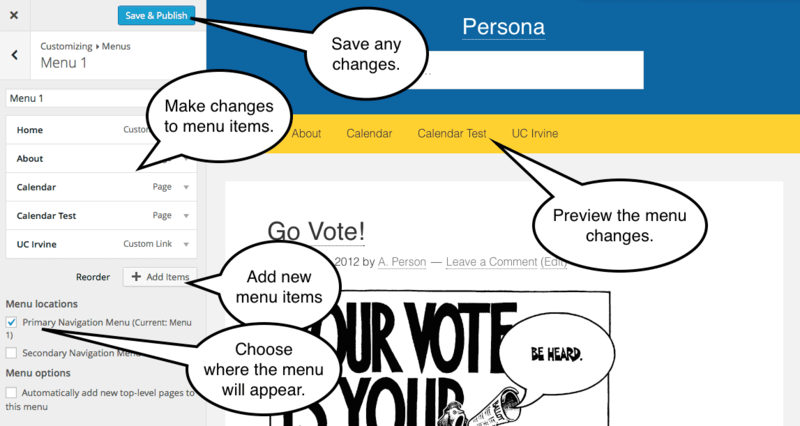 See our Creating Menu Placeholders for instructions. Find the name of your menu item in the Menu Structure section. Click the drop down arrow on the right of the item to reveal the options. 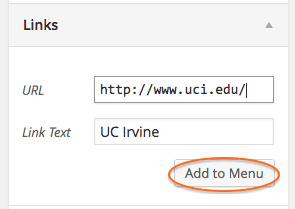 To Modify your menu item – Update the fields, then click Save Menu. To Delete your menu item – Click Remove, then click Save Menu. 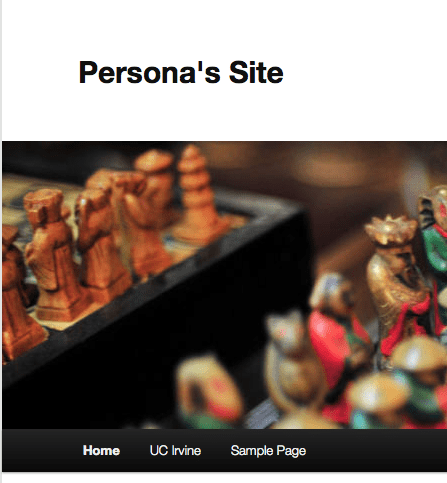 WordPress now lets you manage your custom menus through the Customizer tool available from the Appearance menu. Select Menus from available choices. Select the Menu you want to edit or click the Add a Menu button to create a new menu. While editing the menu, you can add new menu items, reorder the existing items, choose the menu location, etc. The changes to your menu will appear to the right in the preview area. When you are satisfied with your changes, click the Save & Publish button at the top. If you do not want Custom Menus on your site, you may delete them at any time. Once your menu is deleted, we cannot get it back. Deleting your Custom Menu also deletes all of your menu items. In the Menu Settings section, click on Delete Menu.